You’re moments away from writing the best administrative assistant cover letter out there. After weeks of searching, you’ve found the clerical job of your dreams. You’ll manage their documents and paperwork, handle phone calls and correspondence, and greet visitors with a smile from your strategically-positioned ergonomic spinning chair. To get that opportunity, you’ll need a great administrative assistant cover letter. We’ll not only show you how to write a cover letter for an administrative position, but you’ll be able to do it perfectly so you get that all-important interview. And, we’ll walk you through the process step by step all the way. Administrative assistant cover letter examples better than 9 out of 10 other cover letters. How to write a cover letter for admin assistants that will land you more interviews. Tips on how to grab the recruiter’s attention on an administrative cover letter. How to sell yourself on a cover letter for office assistant jobs to get the one you want. 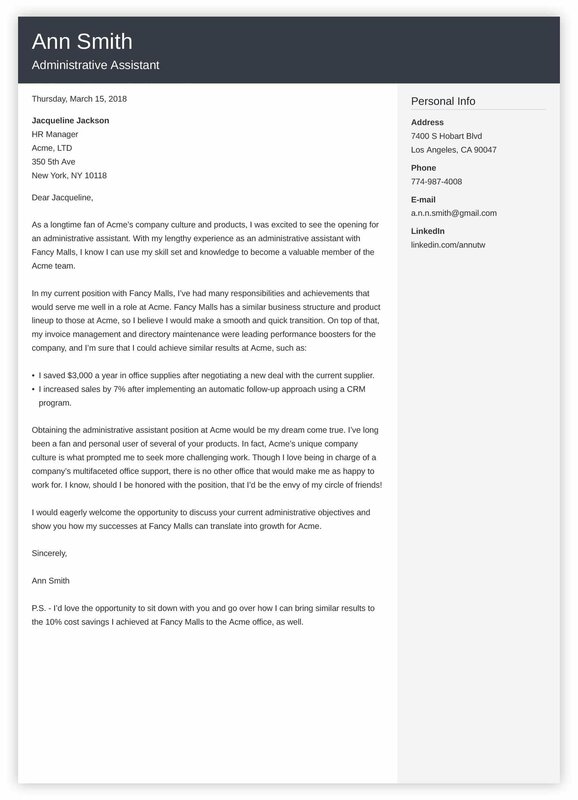 Here's a sample AA cover letter made with our cover letter builder. Want to save time and have your professional admin assistant cover letter ready in minutes? Use our cover letter builder. Choose from 20+ professional cover letter templates that match your administrative assistant resume. See actionable examples and get expert tips along the way. 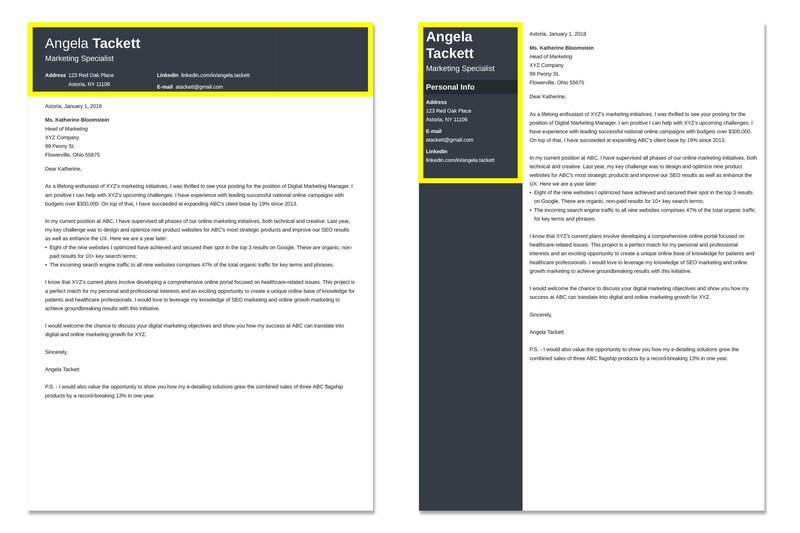 Administrative Assistant cover letter example—See more cover letter templates and create your cover letter here. What’s the Best Structure for Administrative Assistant Cover Letters? Cover letters can feel like a breath of fresh air after the tedium of the resume, as you can write with creativity and style where your administrative assistant resume had to sound robotic and impersonal. Sounds fun, right? However, your AA cover letter is a formal letter, so there is a recommended layout to follow, unlike resume sections which can be moved around. But what does that structure look like, and what should you include on an administrative assistance cover letter? Your contact information and date. A greeting/salutation (e.g., Dear Ms. Johnson,). An opening statement that grabs their attention. Short paragraph on why you’re perfect for their company. Short paragraph on why the administrative position is perfect for you. Closing statement that seals the deal. Complimentary close (e.g., Regards, Sincerely) and your name. Here, we’re following our recommended structure on the elements of the perfect secretarial cover letter. To read more about the method behind our madness, see this article for the best cover letter format: What to Include in a Cover Letter? Pro Tip: Don’t complain just yet! Though you should follow our professional cover letter structure, you’ll have freedom in the way you speak. On the administrative resume, you’ll often use fragmented sentences and phrases, but here, you can stretch a bit. First up, whether you’re putting together a first-time office assistant cover letter or an executive assistant cover letter, is the heading area, just as it was when you were starting your resume. You’ll address and date the document here, and its look and design may vary depending on the cover letter template that you use. Optional items are your mailing address, branding statement, and a LinkedIn profile URL. 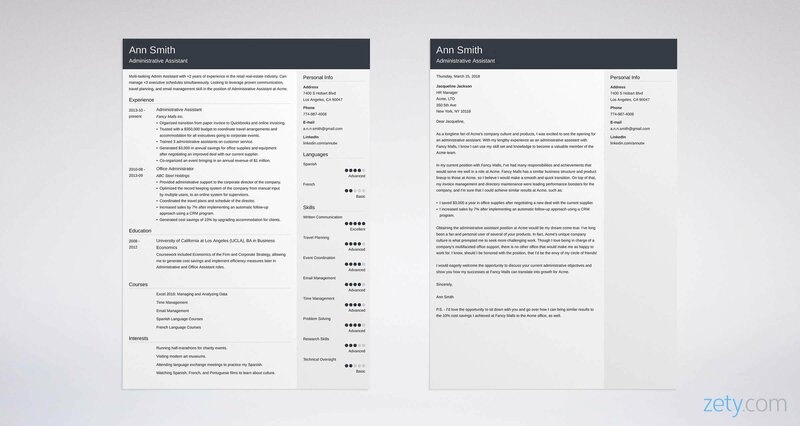 As the addresser, your address can be aligned left, center, or right; I’d suggest sticking to the design of your admin assistant resume. Pro Tip: Don’t add the rest of your social links, profile URLs, and portfolio information with your contact details as you did on your resume, unless the administrative assistant cover letter template you choose includes an area for them. After the date, add the addressee. In your case, it’s the office or agency you are applying at, but try to find the specific name of the hiring manager or HR director to insert at the top of the company address. This makes it more personalized and compelling. When starting the next major company project, company execs and managers will first look to you, their admin assistant, as you’ll be responsible for planning, scheduling, documentation, and other preliminary aspects. Just like a good admin assistant makes all the difference in how the project will progress, the opening area of a cover letter for administrative assistant positions is super important to get right, as its top location gets the most eye time. You wouldn’t be the face of the office if you’d just greet your coworkers with a “hey you” as they walk in. On administrative assistant cover letters, the same rule applies. Finding the name of the HR manager makes the difference between it feeling personalized and it seeming like it was mass-emailed to the entire state. Something like “Dear Ms. Jackson,” works just perfectly, but you can also skip the formality by calling them by their first name: “Dear Jacqueline,”. Like the compelling summary or objective you composed for your AA resume, the opening paragraph on its counterpart cover letter should hook them immediately in a way that makes them want to read further. As a longtime fan of Acme’s company culture and products, I was excited to see the opening for an administrative assistant. With my lengthy experience as an administrative assistant with Fancy Malls, I know I can use my skill set and knowledge to become a valuable member of the Acme team. See that? This one is written about the company specifically, and it gives the HR manager reading it an enticing taste as to how you would be the perfect addition to their team. This makes a great opening paragraph, and it will make them want to read more. Pro Tip: As you called out their name in the greeting, mention the company’s name in the opening paragraph, as well. It feels more personalized, and it assures the hiring manager that they’re reading a dedicated cover letter. Here's an administrative assistant cover letter sample and a matching resume. Want to write your cover letter fast? Use our cover letter builder. Choose from 20+ professional cover letter templates that match your administrative assistant resume. See actionable examples and get expert tips along the way. Administrative Assistant Cover Letter for a Resume—See more cover letter templates and create your cover letter here. Now we get to the main event, the keynote to address - it’s time to sell yourself to them as the perfect candidate out of that resume stack of 250 others. The odds don’t seem to be in your favor, but don’t worry. The next two areas (we suggest a paragraph for each) give you plenty of room to make your case. Though they’re opposites, these sections have a symbiotic relationship. You’ve hooked them with your intro, now start reeling them in with your admin asst. cover letter by showing them how you are the perfect fit for the office and team. I saved $3,000 a year in office supplies after negotiating a new deal with the current supplier. I increased sales by 7% after implementing an automatic follow-up approach using a CRM program. See that? With that paragraph and the quantifiable achievements, you show that your acquired skills and experience would make you the ideal new hire for the job offered. Pro Tip: Remember using keywords on your resume to ensure that it’s tailored? Add them on your admin assistant cover letter, as well. Also, make sure your cover letter is easy to read by using the perfect cover letter font! Obtaining the administrative assistant position at Acme would be my dream come true. I’ve long been a fan and personal user of several of your products. In fact, Acme’s unique company culture is what prompted me to seek more challenging work. Though I love being in charge of a company’s multifaceted office support, there is no other office that would make me as happy to work for. I know, should I be honored with the position, that I’d be the envy of my circle of friends! How about that? You praised the company and explained why they are the center of your universe - that’s hard to resist! This works for this experienced administrative assistant cover letter sample paragraph, but it would work equally well on entry-level admin assistant cover letters. Pro Tip: Tell a joke. Be sincere. Use an exclamation point! Display your wit. Convey your enthusiasm. Make sure that your honest interest in the position is immediately apparent. You’re just about there. You started off strong, and you kept that momentum going throughout. Now, don’t slack off just yet—it’s time to end it with a powerful closing statement. I would eagerly welcome the opportunity to discuss your current administrative objectives and show you how my successes at Fancy Malls can translate into growth for Acme. See that? You bring it to a satisfying end by summarizing your admin assistant cover letter and then leaving the ball in their court. Not hard at all, right? That closing sentiment (“Sincerely” in this case) is called a complimentary close (or complimentary closing), which is then followed by your name to end the cover letter for the administrative assistant position. Pro Tip: You can be creative in your cover letter’s content, but just as with the formal header, where you addressed your cover letter, keep the closing sentiment more formal, as well. Hold up! You said that was it! 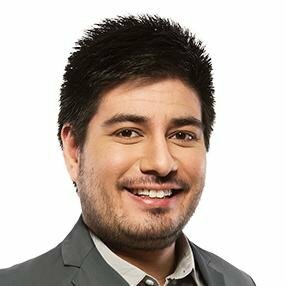 I know, I know, but hear me out for just one more moment, if you will. P.S. - I’d love the opportunity to sit down with you and go over how I can bring similar results to the 10% cost savings I achieved at Fancy Malls to the Acme office, as well. How about that? A P.S. at the bottom of your cover letter for administrative jobs always draws the attention of the reader, even if they don’t read the rest of it. It’s a clever way to get one last word in edgewise and one more opportunity to win them over. Worried you might have missed something? Double-check with our comprehensive list: What to Include in a Cover Letter? As you can see, writing a cover letter for administrative assistants is not as tough as you thought - and nowhere near as complicated as the constant juggling you’ll perform once you get the job. Start with a bang - Your opening statement on your cover letter is important because it’ll determine if the office hiring manager reads on. Show you belong together - Use the majority of the body area to show that you’re a perfect fit for the office or agency and they’re the ideal workplace for you. Finish strong - You held their attention to the end, but use a strong ending so they’ll be sure to move on to your admin assistant resume and grant you that all-important interview. Now just make sure you email your resume properly and prepare for your big day with some helpful interview tips! Do you have any questions on how to write an admin assistant cover letter? Not sure how to address a cover letter, start your body paragraphs, or end your cover letter in a strong way? Get at us in the comments below, and we’ll answer your question. Thanks for reading!